The leaves of Sasanqua Camellias are much smaller and dense than the Japanese Camellias, making for a smaller more compact shrub. 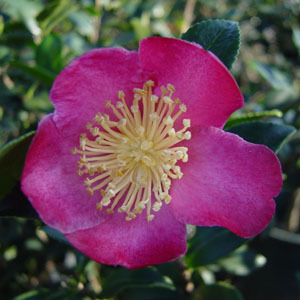 Like the Japanese Camellia Sasanqua Camellias need a moist acidic soil. The Yuletide Camellia has dark green dense foliage and a upright growth habit. The Yuletide blooms a profusion of small, single bright red flowers with bright yellow stamens late in the season, and it has a long bloom season.